Where do I even begin???! This past week was a rollercoaster of a week. I’ve been hopeful one minute and in despair the next…..let me bring you up to speed. Last week I was reading this article that was posted on a fellow blogger’s site. The article includes a list of reasons why one may be at risk for having natural killer cells in the uterine tissue; the article alarmed me (as there were several that fit my profile) and I decided to get in touch with my RE. My RE does not regularly test her patients for natural killer (NK) cells but agreed to do a blood test for me. We opted not to take a swab of my uterine tissue as I would have to cancel my potential upcoming IVF #2 cycle. I went for my blood draw last Wednesday (thank goodness I only had to be poked once this time!) and she said it would likely take 1 week for the results since it would have to be sent out of office for testing. She said “hopefully the results will be normal and we can move ahead and you can have some peace of mind”. I kept thinking it would be normal and life would go on. Friday morning the nurse called and said that the results were in (I was surprised as it had only been 2 days) and that my NK levels were elevated. She said my RE would be calling in the afternoon to discuss it further. My RE called later on Friday and said she would have to do some research as this is not a circumstance that she deals with often and would get back to me on Sunday. Ok……cue the despair!!!! I felt so low on Friday….just one more thing that is wrong with my body. I started to think about gestational carriers, adoption and even the thought of not having children at all. To summarize, the articles state that peripheral natural killer (NK) cell levels are not necessarily a direct correlation to uterine NK levels. Treatments for elevated NK levels include steroid therapy, heparin, and/or intravenous immunoglobulin therapy. However, these treatments have not been well documented to solve infertility for many women. My RE did call yesterday afternoon and we have decided to proceed as planned with my IVF #2 (she said I could add a daily dose of baby aspirin, but she thought even that could cause some unnecessary risks, therefore we opted not to do the baby aspirin). I know there are going to be opinions regarding our decision, but for now I am happy with the decision we made and hope and pray that this time around the IVF will work. I’m on CD 37 and AF still has not showed up. I had an ultrasound this AM to check out the situation and it looks like I still need to wait for AF to show up before starting my stimulation medications. I have done 12 doses of Lupron (10 units/dose) and will continue on for now. I only had 7 follicles today, so I’m worried about being oversuppressed again but I’m trying to go with a more relaxed attitude than last time because the devastation of cancelling was tough. I’ll keep you posted…. Ok…..now onto more fun stuff. 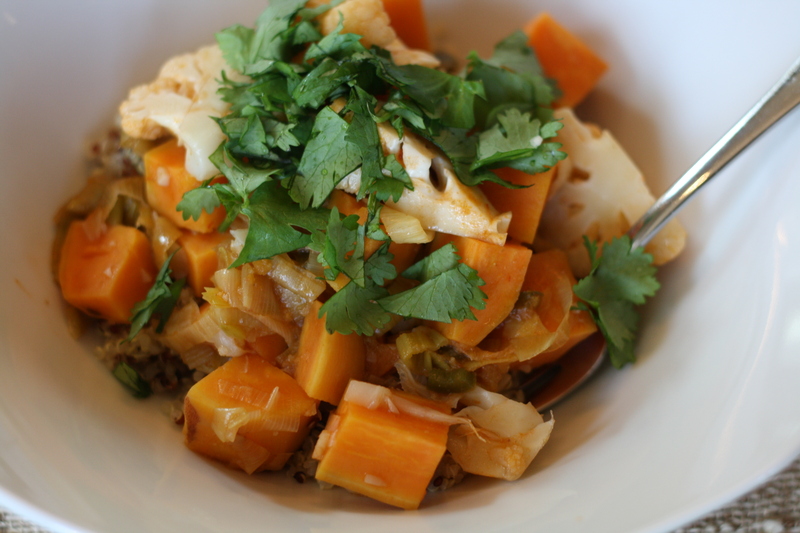 Since it’s officially fall now, I thought I could finally share a recipe including sweet potatoes. This is one of Hubby and I’s favorite fall dishes. It is warm, comforting and is perfect to enjoy on a cool fall evening. 1. Heat oil over medium heat in a pot. 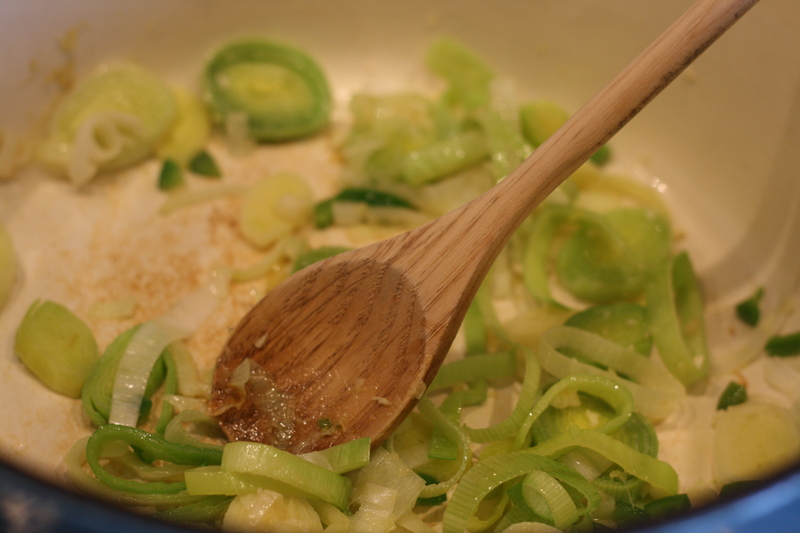 When hot, add leeks, ginger, garlic and jalapeno, and saute until leeks begin to soften, about 5 minutes. 2. Add cumin and tomato paste and cook, stirring constantly, until fragrant, 1 minute. 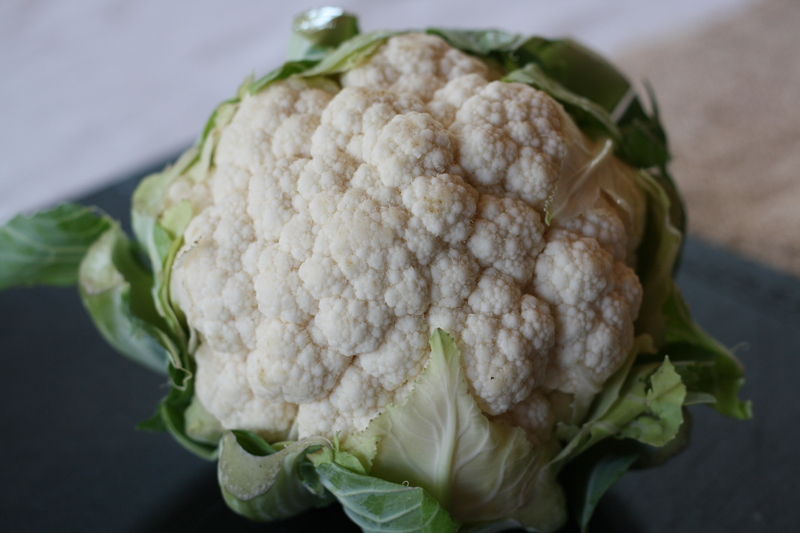 Add potatoes and cauliflower, followed by salt, and coat with tomato mixture. 3. Add broth, olives and cinnamon stick, and bring to a boil. 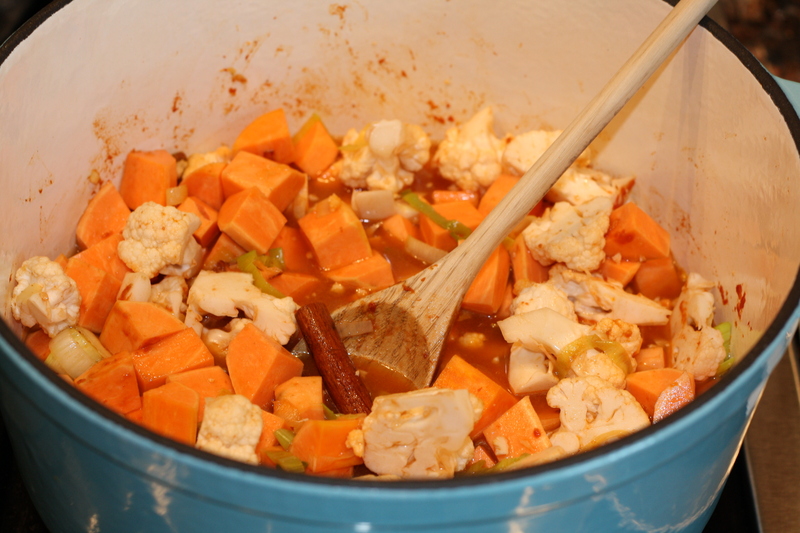 Reduce heat to medium-low and simmer, partially covered, until potatoes are tender, about 20 minutes. 4. 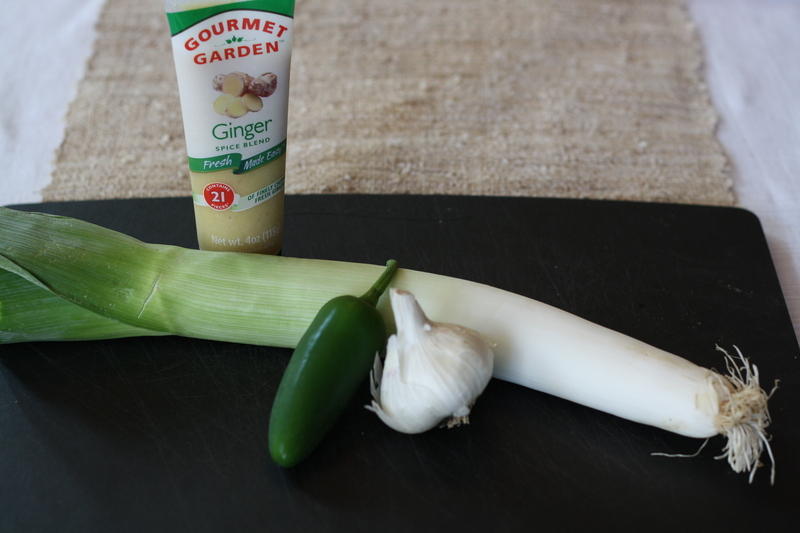 Remove cinnamon stick, garnish with cilantro and serve on couscous (quinoa). I’m so glad that this dish is both gluten and dairy-free; although, I was enjoying it long before I was avoiding both gluten and dairy. It definitely warms the tummy and the soul and was a nice way to transition into fall. I had a tough few days and cozying up with Hubby and a bowl of this tangine made things better for a while, even though we still have a long road ahead of us. Praying for you dear friend! I’ve been looking for an update, sad to see it wasn’t all positive news. Keep moving forward friend, you will get there! BTW, I am totally making this dish, I love everything about it! Thanks Darcy, I’ll keep you posted! Sorry to see there’s not much good news for you to report…. (sending virtual hugs!) 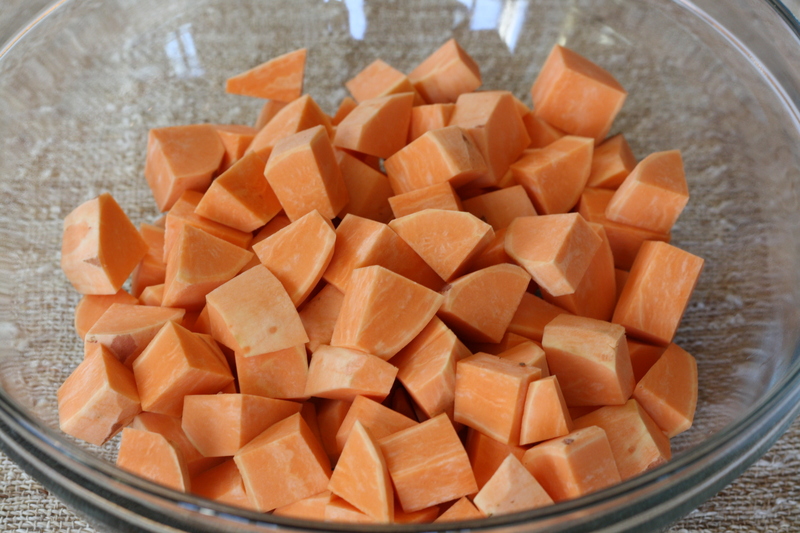 However, that recipe is super delicious looking…I can smell the sweet potatoes through my screen! lol, I will definitely have to try this one. Thanks Bree, I’m going for another ultrasound tomorrow, so I’ll hopefully get more information then. You’re welcome. I will be praying for a positive outcome for you….fingers crossed! I’m sorry about this news (impressed by your research though). I look forward to reading your updates, thank you for keeping us all posted. Looking forward to seeing you next week! Thanks Tribby, yes, can’t wait to see you! i would probably be freaking out this week if this were happening to me. I’m so sorry about all you went through. hopefully in the end, everything turns out for the best. sending you happy vibes! p.s. your recipe looks amazing! I have concerns myself about autoimmune issues being the reasons for our failed cycles. I hope you can get some clear answers and are closer to your take home baby. Recipe looks so good. I’m hungry now.